The 7th HLF will take place from September 22 to 27, 2019 […]. This prominent, versatile event combines scientific, social and outreach activities in a unique atmosphere, fuelled by comprehensive exchange and scientific inspiration. Laureate lectures, young researcher workshops and a structure welcoming unfettered discussions are the elements that compose the Forum’s platform. Applications are now open (until 15th February) for the 2019 HLF – if you are or know someone who’s an undergrad, postgrad or postdoc in maths or computer science who might enjoy a week away in scenic Bavaria with some of the world’s greatest mathematicians and computer scientists, applications can be made at application.heidelberg-laureate-forum.org. You may know from our recent foray into breaking news that the Fields Medal awarded to Caucher Birkar was stolen, minutes after it was awarded. It turns out the International Mathematical Committee (IMU) had a spare medal in Rio for display purposes, and they decided to award it to Birkar as a replacement. Birkar is quoted as joking “I’m much more famous than I would be,” in reference to the increased media attention following the theft. Being the first person in the world to ever receive the Fields Medal twice certainly makes him a good answer to a trivia question at your next maths-themed pub quiz. A post from the International Congress of Mathematicians (ICM) tries to play down the incident. ICM Chairman Marcelo Viana called it a “regretful incident with a happy ending” – slightly strange as the stolen medal hasn’t been found – and Birkar himself is quoted saying how lovely Rio is. “I’m more famous now than I would be”, jokes Birkar. Have you seen this medal? Reports are emerging of the disappearance of one of the Fields medals awarded today, to Cauchar Birkar. The official statement from the International Congress of Mathematics is reproduced below. The organizing committee of the International Congress of Mathematics (ICM2018) profoundly regrets the disappearance of the briefcase of mathematician, Cauchar Birkar, which contained the Fields Medal he received at this morning’s ceremony. Images recorded at the event are being analyzed. The organizing committee is cooperating with local police authorities in their investigation. UPDATE (morning of 2nd August): The briefcase has been found by a security team under a bench, with the medal missing. Birkar’s phone and wallet were also in the briefcase. The thief is said to have been identified from security footage, so hopefully the medal can be found. The event was also troubled earlier in the week by an accidental fire on the roof of the building, which caused the event’s overnight team to evacuate. UPDATE (evening of 2nd August): The ICM have published these photos of the suspects. UPDATE (evening of 3rd August): The ICM have announced that Birkar will receive a new medal at noon (in Rio) tomorrow. “A lot of the time, when you do Math, you’re stuck. But you feel privileged to work with it. You have a feeling of transcendence and feel like you’ve been part of something really meaningful.” – Akshay Venkatesh, 2018 Fields Medallist. The Fields Medal is awarded every four years to four mathematicians, in recognition of outstanding achievement in mathematics. 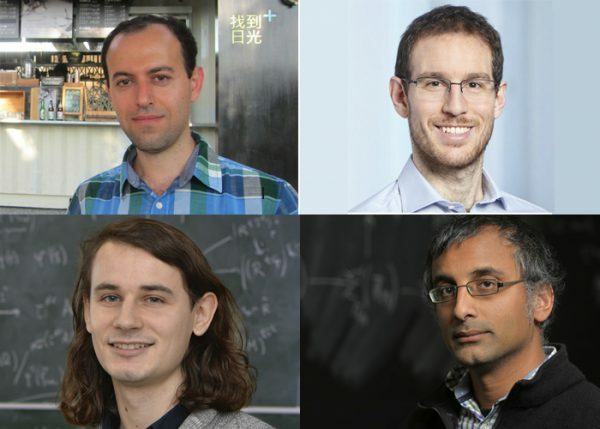 This year’s winners have just been announced at the International Congress of Mathematicians in Rio de Janeiro, and they are algebraic geometer Caucher Birkar, PDE specialist Alessio Figalli, arithmetic algebraic geometer Peter Scholze, and number theorist Akshay Venkatesh. At this week’s International Congress of Mathematics, in Seoul, Korea, the winners of the 2014 Fields Medal were announced. The medals, which were established in 1936, and are awarded every four years to four different mathematicians, recognise achievement in mathematics research.